Have you ever wondered how our brains respond to the changing levels of stress in our lives? A few generations ago, life was not as stressful. The only stressors were availability of food and shelter. But today, we have stress in every aspect of our life. 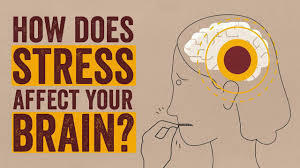 Do you think your brain is equipped to handle this stress? We Can't Focus Any More. Today, there are so many things around us that are demanding our attention. It is like your brain has too many windows open and you can't decide which one to work on. This is why children and adults find it hard to focus. This is not just a problem at work or while studying, it also makes us unhappy. Our Brains are Tired. When we focus too much, our brains get tired. This leads to stress. Stress tends to make or brains feel more tired. This goes on in a loop till we give our brains some rest! Women are more prone to stress than men. In a study it was revealed that women get stressed more easily than men. This stress leads to physical symptoms like stomach disorders, headaches etc more often in women as compared to men. You will be surpised to know that stress doubles your risk of Type 2 Diabetes. This is because middle aged women are the most stressed people on earth. We are stressed about work, home and family. We are so stressed that physical manifestations like Type 2 Diabetes are an expected outcome! What to Do? In order to live a happy and healthy life, try to eliminate stress. If you cannot eliminate stress, incorporate stress buters into your life. It could be a simple hobby like gardening or yoga. Do whatever you love to do and get rid of some of your stress! 5 Food Items That are Good for Your Brain. One more bomb blast? Where is our Security?